Don’t miss this exclusive opportunity to join a table of Port Macquarie’s most influential business people for a private dining experience with special guest, Bernard Salt. Bernard is Australia’s leading social commentator and Head of the Demographics Group. He has regular columns in The Australian and has authored six books on social, generational and demographic matters. Bernard’s unique skill is to take the latest data and transfer it into a highly entertaining, very informative and extremely relevant presentation on the future environment for both business and individuals. 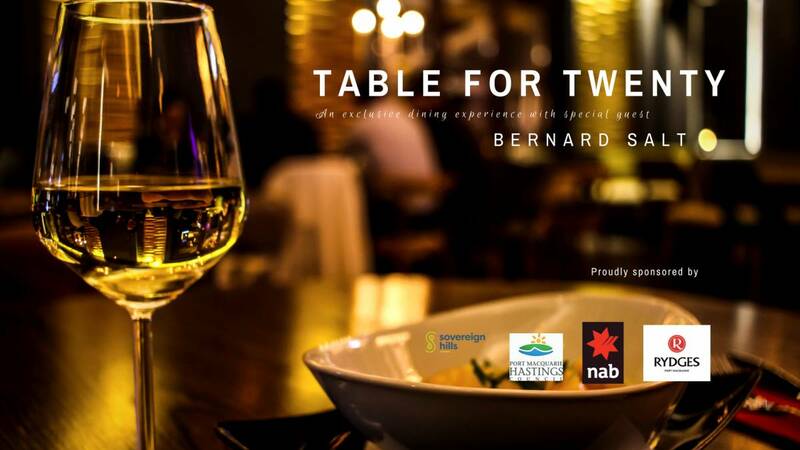 Limited to a table of twenty, this unique and intimate social gathering provides the chance to share thoughts and ideas with Bernard and guests, over a sumptuous five course dinner in the prestigious Zebu room, overlooking the beautiful Hastings River. Reserve your premier seat now!